We custom manufacture beautifully appointed Marine Windows in both dual pane and single pane for the luxury houseboat market. Since there is no such thing as a standard size, we will fabricate sliding or fixed windows to meet your specifications. You also have a variety of glass tints and powder coat frame colors to choose from to help you personalize your home away from home on the water. All of our sliding windows include sliding screens and we offer both vintage look mitered corners as well as the more modern radius cornered frames. Our window lines are basic and clean. You’ll find functionality along every inch of our well planned designs. Motion Windows are dependable. And we are proud to tell you, they are made in the U.S.A.
Because of our custom manufacturing practices, we are a leading choice for smaller to mid-size boat manufacturers. We have the flexibility to offer a variety of choices of glass tints and frame colors to personalize each job and give your boats a unique look and the character it needs to stand out in the crowd. Our dependable lead times, aggressive price points and attention to detail are all attributes that you’ll find refreshing. Our goal is for our products and service to exceed your expectations. We also take great pride in servicing the private sector as well. Whether you are the “I’m going to build my own boat” guy or the “It’s time to update our old boat” couple, we’ll walk you through the process and make sure that you get what you need. We are a family-owned business, so our success is directly tied to your satisfaction. We depend on a little word of mouth advertising from our satisfied customer base to sustain our business model. We don’t spend a lot of money on big glossy magazine advertisements. We are very selective on the number of trade shows we attend. We choose to spend our money on product enhancements and our employees. The premise is this: If you have a good product, built by people who care about the process and back it all up with solid customer service – sales will come. We are excited about the opportunity to add you to our family. 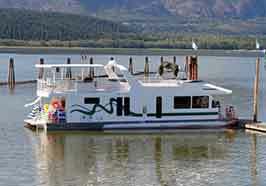 Please help us describe your houseboat windows needs by getting started here.